"Finally, a traffic island worth the effort! 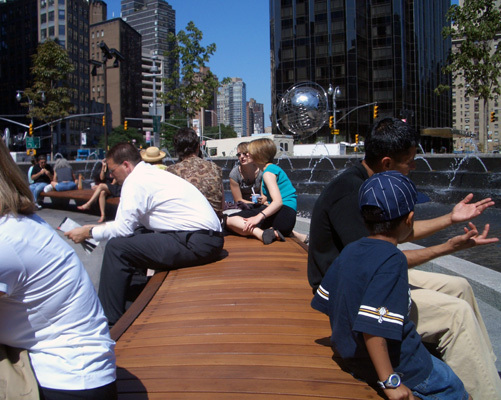 This project makes a real difference, it animates the urban design of that area." 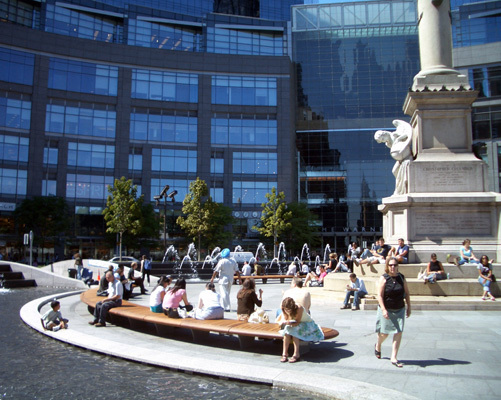 In conjunction with the development of the Time Warner Center, the City of New York commissioned a redesign of the historic circle in 1997. 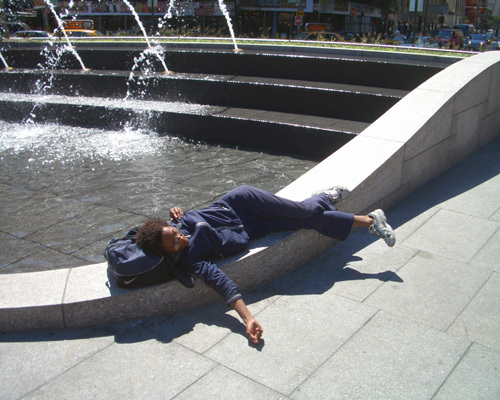 In 2001, the landscape architecture team and collaborating engineers developed a design that would transform the site into a powerful urban space attracting New York City residents and visitors with its vibrant planting, a series of fountains, striking benches, paving and lighting, all working together to accentuate the uniqueness and vitality of the Circle and the city as a whole. 2. Project size: The inner circle measures approximately 36,000 square feet. The outer circle is approximately 148,000 square feet. 3. Intent: The intent of the design was to return the historic monument to public access and appreciation, fostering a safe and interactive environment not present for a generation. 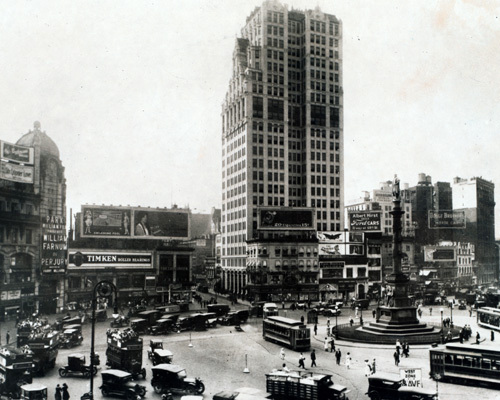 The landscape design was conceived to secure the site as an attractive addition to the public realm of New York City at one of the principal entries to Central Park and the intersection of three significant streets: Broadway, Eighth Avenue and 59th Street. The design is based on concentric rings of movement and light to elicit the feeling that the Circle is not only the center of New York City, but also the center of the universe. 4. Design challenges: Two subway tunnels and an elaborate network of both private and public utilities, including electric, telephone and sewers, are located beneath the Circle. All utilities that were in conflict of the redesign were addressed with the appropriate utility representatives to discuss opportunities for relocation. Surface treatments, sidewalks, lighting and amenity designs around the project site were coordinated with adjacent property owners. The site also suffered from clutter due to an excess of traffic signs and lighting. The landscape design team collaborated with city agencies to reduce the number of signs and light fixtures without jeopardizing the safety of pedestrians and drivers. 5. 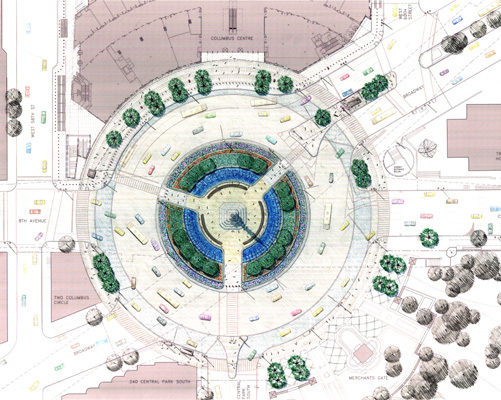 Materials and installation methods used: With agency agreement on the geometric and pedestrian access plan, the landscape architects prepared a design of the inner circle that included a new fountain, monument and pedestrian lighting, and site amenities. 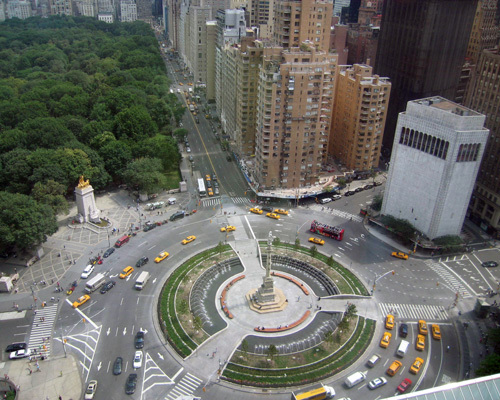 Today, Columbus Circle, with the monument at its center, consists of a series of concentric rings that buffer the traffic; a broad, gently raised area of planting; and a series of fountains, paving, benches and lights. On the outer perimeter, a ring of raised stone cobbles establish setback areas for street lighting, signals, signage, etc., so that the inner pedestrian area remains free of clutter. 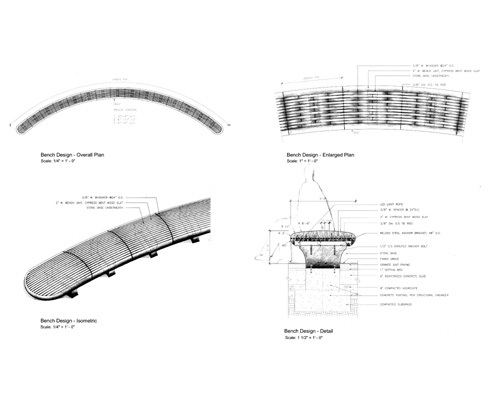 The outer cobble band provides a buffer area between the planting beds and adjacent travel lanes that minimizes intrusion of salt and road debris into the planter beds. 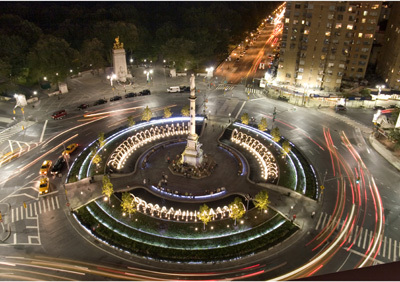 The previous small fountain surrounding the monument base was removed and replaced by a central plaza that reinforces the monument's grandeur within the Circle. Visitors can now approach the monument, read the inscriptions, study the relief sculptures and occupy the center of the Circle - something that was not previously possible. 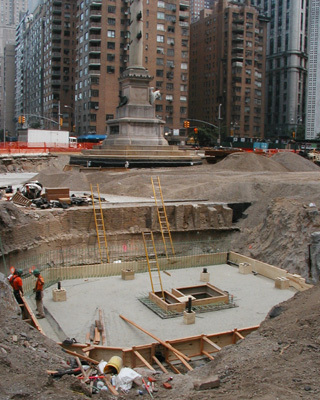 Replacing the central fountain are three new basins that encircle the central open area. Shaped as a series of concentric ledges that form cascading jets arching toward the center, the new fountains reinforces the circular design and primacy of the monument while masking the noise of the traffic and tempering the climate in summer. The new fountain is simple and honorific. When turned off, it serves as a series of bleacher seats to avoid the forlorn character of many empty fountain bases during the winter months. 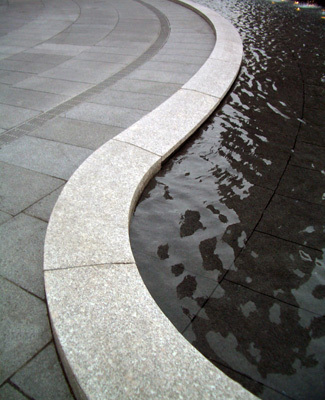 New custom designed benches made of Brazilian Ipé wood run along the edge of the fountain. 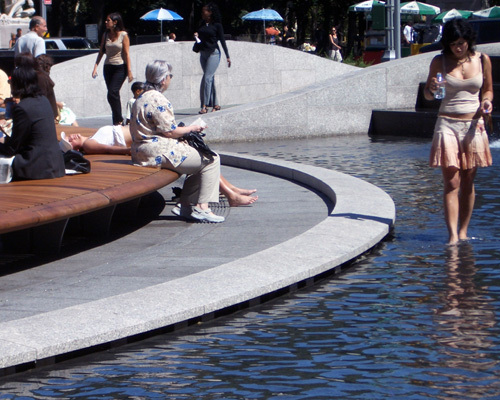 The benches are scaled to complement the civic space and are large enough to allow individuals to sit comfortably back-to-back, facing either the active water and planting or the monument. 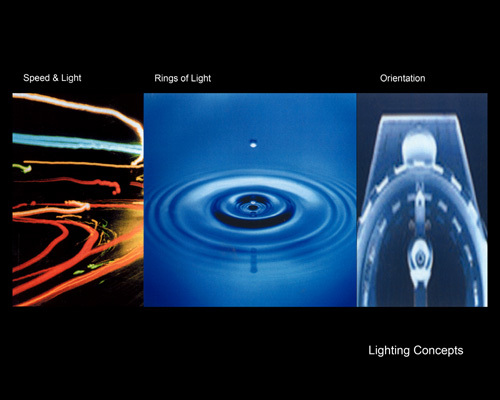 Lighting is also a central component of the site's landscape design. The number of lighting fixtures was greatly reduced in order to eliminate clutter. What remains is what is necessary for the safety of people and traffic flow. Roadside lighting was eliminated from the inside of the Circle and now roads are lit from the outside edge only. All of the lighting reinforces the site's theme of concentric circles. 6. Plantings: The plantings provide concentric rings of beauty and a year-round color palette. A ring of American Yellow Buckeye trees frame axial views to the historic monument, while providing a partial enclosure in the center where the monument stands. Rings of Liriope, Sporobulus, Cotoneaster and colorful annuals surround the trees. The outside circle is home to Honey Locust trees, which provide excellent light shade for the walkways. 7. 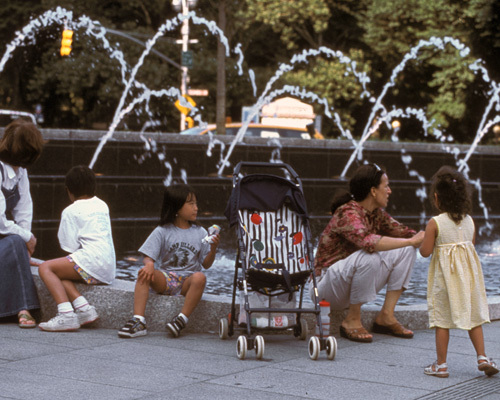 Community context: Columbus Circle is now a place to pause and refresh oneself in the midst of one of the busiest intersections in the metropolis. 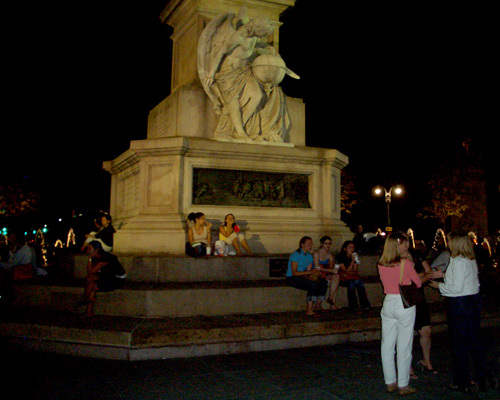 It is a foyer to Central Park, an event on Broadway, and a handsome scene for those who live, work and visit the city. 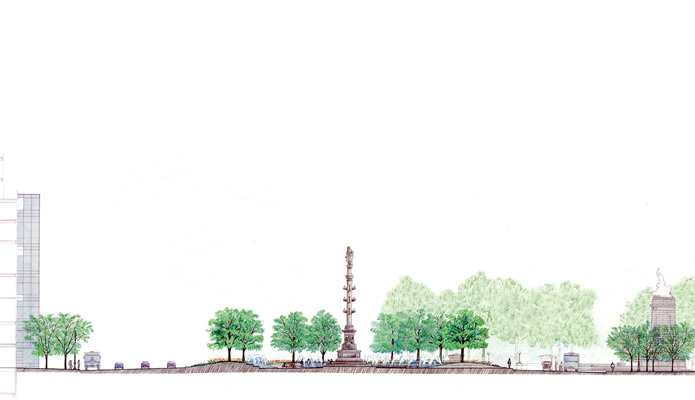 The landscape design improvements signify the importance of this civic space and monument, and secure it as an inviting and celebratory place. 8. Environmental impact and concerns: Returning traffic to a circular patter has calmed and eased the flow of traffic. The new crosswalks and circle design have improved pedestrian safety. 9. Collaboration process among owner/client and designer(s): The complexity of the project required close collaboration between the landscape architect, civil and structural engineers, fountain and lighting designers, as well as the Metropolitan Transportation Authority, the developers of Time Warner Center and the City of New York, represented by the City Planning Office, the Department of Design Construction, the Department of Parks and Recreation and the Central Park Conservancy. The landscape design team worked with other organizations during the redesign of the project, including the Art Commission of the City of New York, the Landmarks and Preservation Commission and neighborhood community boards.